Three weeks following the initial indication that Italian Classics specialist, Luca Paolini, might sign for Andre Tchmil's Team Katusha, the addition was confirmed by Katusha on Thursday. Former Classics star, Andre Tchmil, was pleased with his new addition: "We think Paolini is a great force in the Spring Classics and believe that he can also still win on occasion." The 33 year old inked a one year deal with the Russian superteam following a three year stint with Acqua e Sapone. Paolini should be a critical addition for the team in its hopes of elevating Filippo Pozzato from podium finisher to race winner in the spring's biggest races. Paolini is the final addition to the Classics core of the Katusha team, which was bolstered this off season by Leif Hoste and Aleksandr Kuschynski as well. Together, the four riders will pose a powerful bloc. 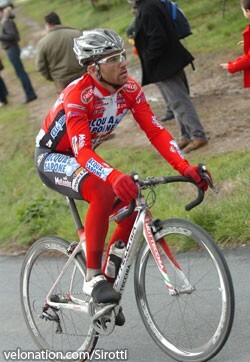 Katusha is the fifth team in the eleven year career of Paolini. The rider from Milan spent the first six years of his career under the tutelage of Patrick Lefevere with Mapei and its three incarnations: Mapei-QuickStep, QuickStep-Davitamon, and QuickStep. Paolini then moved over to Liquigas for a two year stint, before finding a home with Acqua e Sapone for the past three seasons. Along with victories in the Giro del Piemonte, Brabantse Pijl, and a stage of the Tour of Spain, Paolini has also previously finished on the podium in some of the biggest races in cycling including the Ronde van Vlaanderen (3rd, 2007), Milano-Sanremo (3rd, 2006), and the Vattenfall Cyclassics (2nd, 2005). The Italian enjoyed a solid season with 4th at the Omloop Het Nieuwsblad, 17th at the Strade Bianche, 10th at Milano-Sanremo, 6th at the Dwars door Vlaanderen, 10th at Gent-Wevelgem, and third overall at the Three Days of De Panne, including a second place in Stage 1.